I was born in 1968 in Uruguay. Since very young I lived in a small town called Melo, in the northeast of Uruguay, near the border with Brazil. I did my undergraduate studies in business Administration at the University of Montevideo. I stayed working in Montevideo for few years and then lived in Costa Rica for 3 years. When returning to Uruguay I went to live in the city of my childhood, Melo, where I married in 2008 with Carolina. We have two sons, Francisco (3 years old) and Gonzalo (1 year old). In 1987 I got interested in ham radio operating as a guest in some friend’s stations. In 1993 I got my callsign CX6VM and my first contest was CQWW CW 1993 winning 1st place World in 15m low power. Over the years I had a lot of friends from this hobby and with some of them we traveled to operate from DX locations, like ZP0R, LT1F, ZP6T, TI5N, 9Y4W, PJ4K, ZW5B. 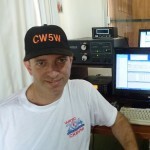 In 2007 started the construction of the CW5W contest station at my family farm. Since 2007 until now was a continuous growing and maintenance of this contest station. Lots of work to do and very few hams near me. There are things you need to try to do at least once in life, one is to participate in WRTC. Even better is to have the honor of being the first Uruguayan to participate in a WRTC.